NEW YORK (AP) — Acting U.S. Attorney General Matthew Whitaker erroneously told an audience of law enforcement officials Wednesday that a terrorist who set off bombs in New York City and New Jersey had two co-conspirators overseas and that one was in custody. Whitaker, who took over as the head of the Justice Department this month, made the remarks about the case of convicted bomber Ahmad Rahimi while addressing members of the Joint Terrorism Task Force, a team of police officials and federal agents who cooperate on terrorism investigations. “One of them attempted to buy a plane ticket to come here and participate in those attacks. Now he’s getting a plane ride back to America but it’s care of an extradition order,” Whitaker said. No mention of co-conspirators was made at Rahimi’s trial, where he was convicted of detonating bombs that exploded in the Chelsea neighborhood of Manhattan and at a running event in New Jersey. After receiving media inquiries about the comments, a Justice Department spokeswoman said the agency was issuing a “correction.” Whitaker’s comments on Rahimi having co-conspirators were included in a copy of his prepared remarks sent to reporters, but stricken from the version posted on the Justice Department website. The Justice Department later clarified that Whitaker’s prepared remarks originally included references to a defendant other than the Chelsea bomber, but those statements were removed from the speech after a sentencing was postponed. The department did not identify the other case but said a reference to it “was inadvertently” left in the speech. Whitaker’s talk to the Joint Terrorism task force came during a two-day visit to New York. He also visited the National 9/11 Memorial and Museum at the World Trade Center Wednesday morning and met with U.S. attorneys for the region Tuesday evening. In his address Wednesday, Whitaker also announced $56 million in grant funding for local law enforcement around the country, a disbursement that includes $29 million for bulletproof vests and $12.2 million for body-worn cameras. 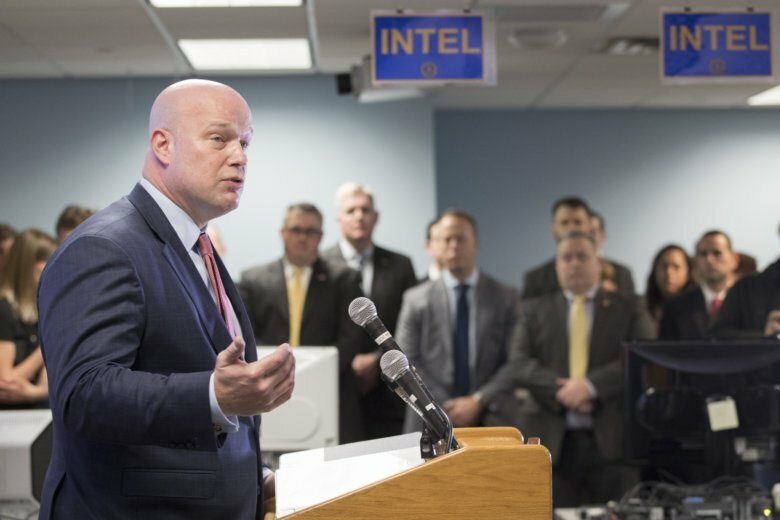 Whitaker said counterterrorism remains the priority of the Justice Department, and he praised the Joint Terrorism Task Force’s work on a number of recent cases in New York. Balsamo reported from Washington D.C.